Get the best night's sleep you've ever had with this Select Luxury gel memory foam mattress. 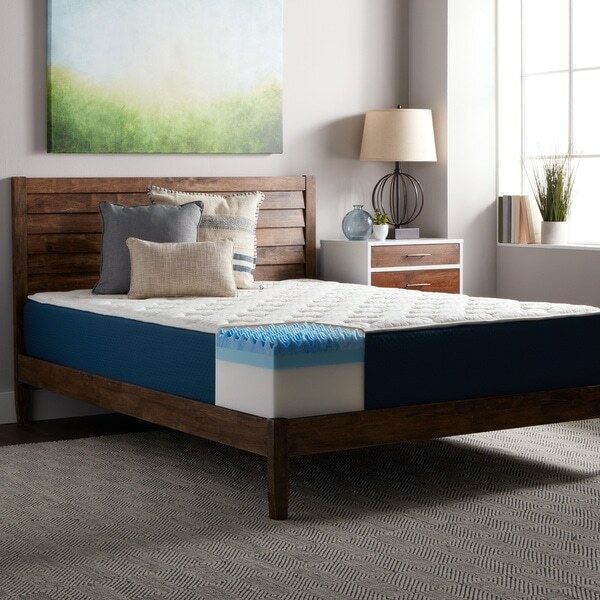 This mattress features the most advanced materials to ensure your comfort and rest, including a quilted top, a layer of gel memory foam, gel transition foam, and a high-density foam base for support. These materials and the sculpted AirFlow layer ensure that body heat will be distributed in such a way as to keep you cool. I did a lot of research on different Gel Memory Foam Mattresses anywhere from *** and many of the internet versions are the same materials that are sold on great discount websites like Overstock. I bought this mattress during the President's Day sale with a 17% coupon and got a great deal. It arrived a week later and I got plenty of notice for the delivery date that I could schedule an alternative date when I was home to accept delivery so UPS wouldn't just leave it at my door. I opened it up and let it deflate for about 10 hours before I went to bed. I've been getting great sleep and the common misconception of Gel Memory Foam Mattresses being too hot and not directing the body heat or in my case not being firm enough when ordering a Firm Mattress have not been true. I bought this really thinking is would be more like a deluxe mattress topper to add to my existing mattress set up.. I am a big guy and the 18" foam mattress I have wasn't quite enough support for me. This addition is actually (almost) more than I bargained for. I wanted a great feel and this mattress delivers, without a doubt. It is hard to believe that what comes in a 15 x 15 x 60 box turns into a full-fledged mattress, but it does. In 24 hours, it is proven that all it claims to be is true! I never ordered from Overstock before and I was very hesitant about ordering a mattress from online that had no reviews. After deep thought, we decided to go ahead and order; for that price and size hey!! you cant beat it. It arrived, we aired it out NO HARSH CHEMICAL SMELL; IT WAS WORTH IT. Very comfortable, contours to the body, and soft top. We ordered firm and that exactly what it is; not too hard and/or soft. I knew it was a great choice, because my husband has back problems and he has yet to complain. I do suggest purchasing a mattress encasement, to protect the fabric. Oh yea! We've had it for about a month now. I was skeptical of ordering a mattress online but I'm really glad I did. There was only a faint odor when I took it out of the box which was gone within a few hrs. The mattress began inflating immediately. The instructions say it takes 72 hrs to fully inflate, but it felt pretty full after 24hrs. It is so comfortable. Like sleeping on a cloud. It's not too firm, but it's not too soft either. The bed doesn't move when my bf rolls over or gets out of bed and we can both sleep peacefully now! I will never go back to a spring mattress ever again! I was so excited when my Select luxury 12 inch quilted airflow gel memory foam mattress pad arrived. My son needed one for college. It lasted the whole school year. Great quality. I highly recommend this product for kids going off to school. My boyfriend and I ordered this mattress and are beyond impressed with it! After opening it, it immediately started to "grow." Within 48 hours it was was at its full 12". We slept on it for the first time last night and WOW. We both found it to be both soft and firm at the same time. The pillow top makes it so comfy and the memory foam keeps you supported. We agreed this morning that no matter what position we laid in, we were comfortable. We are sure we couldn't have found a more perfect mattress and are so glad we chose this one! We bought this bed for our 16 year old son. I was skeptical but I love Select Luxury memory foam mattresses so I thought we'd give this a try. It's great. It does feel different than typical memory foam mattresses since it's tufted on top. That does make a big difference in the way it feels. I would recommend this mattress. When I first laid down I was amazed at how comfortable it felt. Unfortunately, shortly after using this matress I began waking up with tremendous back pain. It goes away with 30 minutes of getting up in the morning and but the sleep quality I'm receiving is terrible. Its too late to exchange for something else. Be careful buying a matress with such a short return deadline. It's not enough time to tell if the matress is right for you and unless you're lucky enough to get one that works you will feel ripped off like I do. I’ve had it over a year now It was a really nice mattress for about the first 4 months. After that, it began to develop a sag in the middle. It doesn’t provide enough support for me. That being said, it’s a medium firm. I probably need a firm mattress. We've had this mattress for a few months. It's not that it's super uncomfortable, but is much softer than I expected. I tend to lay in one spot all night and there is a huge dip on my side of the bed. Maybe if I moved around more, it would not be so bad, but I'm going to chalk this up to "don't buy a mattress on the internet". Wish I would have saved my money towards a more expensive mattress. This is a super comfortable mattress. It has the perfect balance of softness and support. Great Mattress for a Great Price. The mattress was easy to set up and quite comfortable to sleep on. It replaced an older mattress for an adjustable bed and it works very well. Absolutely in love. We recently purchased this mattress to replace our old bed. We could not be happier. It so so soft and comfortable. It has just the right amount of give without making you feel like you are sinking through to the floor. So happy we bought this. This mattress is comfortable, on the firm side. I personally would have liked a little more softness but this is the gamble we take ordering mattresses online, no fault of overstock. Was packaged well and I was able to sleep on it the same night I unpacked. Perfect for my back. How do they put that huge mattress in such a small box that it came with? I have no complaints with this mattress sleeping on it for 5days. If you want a medium to firm gel foam mattress,this is the perfect choice. Very easy setup. Came rolled up on a box. Removed plastic and placed on frame. Almost completely released immediately..instructions state it takes up to 72 hours to completely rise. Very firm considering it was rolled up. But dreamy nights sleep our guests stated. "What is the density rating and indentation load deflection for each option (firm, medium, and plush)? Thank you!" I have it on a platform bed and it works fine without a box spring. A box spring is not required for this item. However, the mattress should be set upon a flat, solid surface such as a platform bed, a solid surface foundation, or a piece of plywood if the existing box spring has slats further apart than 2 inches or coils. "Can I use this in a waterbef frame 60 wide by 83 long, the mattress area is a frame? Please respond. We purchased one from you for our guestroom in Florida and it's great, I would like to replace our water bed mattress with the same one if possible." Well the mattress is 60 x 80 x12 so you are going to have an inch and a half on each side and depending on how deep your water bed frame is, the mattress will sit 12' high and lower when bodies are on it. If your bed frame has slats on the bottom to support the mattress, it should work. Yes, this mattress can be used with this waterbed frame. However, there will be a 3-inch gap between the mattress and the frame lengthwise. Note: the mattress does need to sit on a flat, solid surface. "Would this mattress work for a Murphy bed?" I think so. At least the Firm Version of it would, because it's pretty dense and should stand up with just the regular security strap around it. "Is there a manufacturer's warranty for this mattress?" "Can this mattress be placed over box springs?" Yes, this mattress can be placed on a box spring. "My husband is usually hot and I'm always cold so finding a mattress to suit both of us is impossible. Is there enough airflow to keep us both comfortable? Thanks."